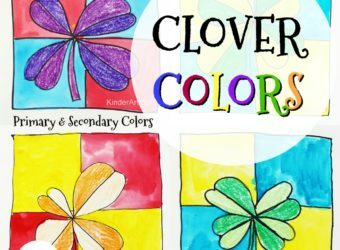 Here are five creative arts and crafts activities kids can do on their own (depending on age, of course). Best of all, the materials are inexpensive and easily accessible. In fact, most can be found at your neighbourhood dollar store. 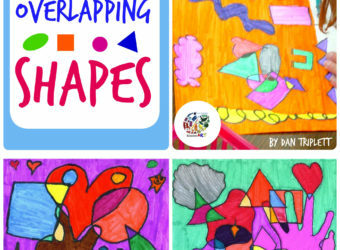 Paper and drawing materials (markers, pencil crayons, crayons) are all you need for this activity where kids simply draw some lines with a marker on paper and then fill in the blank spaces with colours. 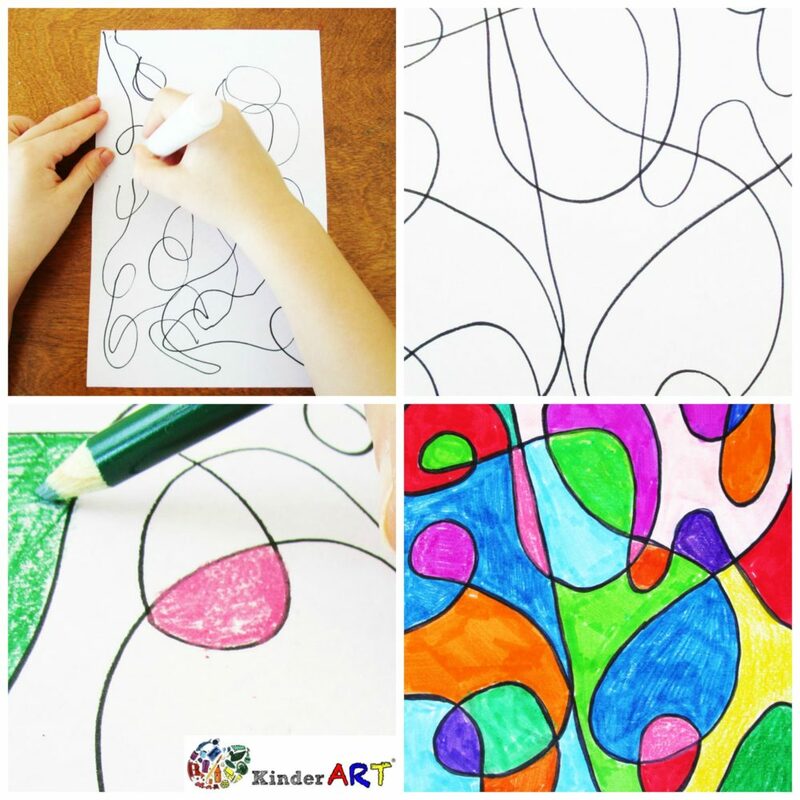 Or, kids can take it one step further and find hidden monsters and critters in their drawings. Doodling is great because you never know what might develop. It always amazes me how much kids (even older kids) LOVE making puppets, putting on puppet shows and talking to puppets. Creating hand puppets like these ones is easy. All you need are some bits of felt and yarn, scissors, googly eyes and glue. 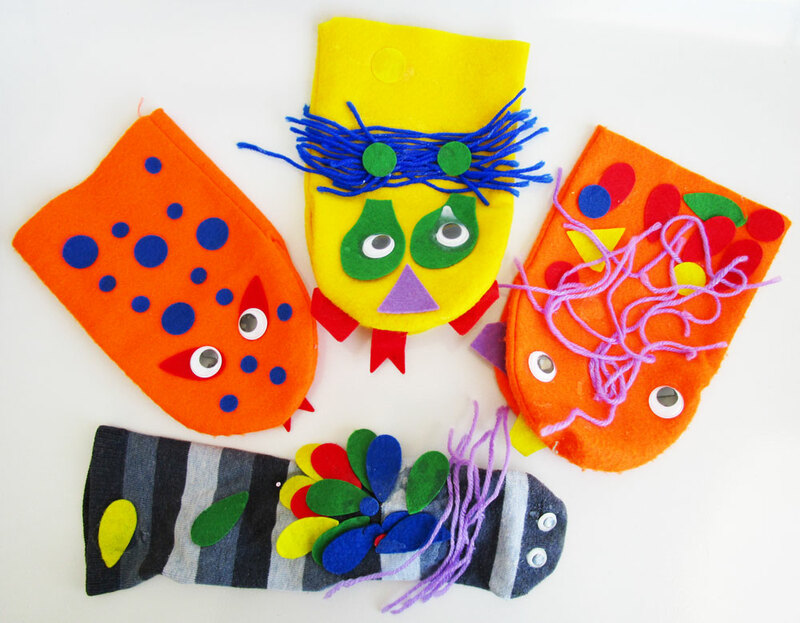 There are lots of kits out there that make crafting puppets super easy (like this one featuring felt puppet blanks and all the supplies needed – from Discount School Supply) or you can gather the supplies on your own and let your kids use odd socks. I have yet to meet a kid who doesn’t love beads. Boys, girls, young, old… it doesn’t matter. They all adore them. 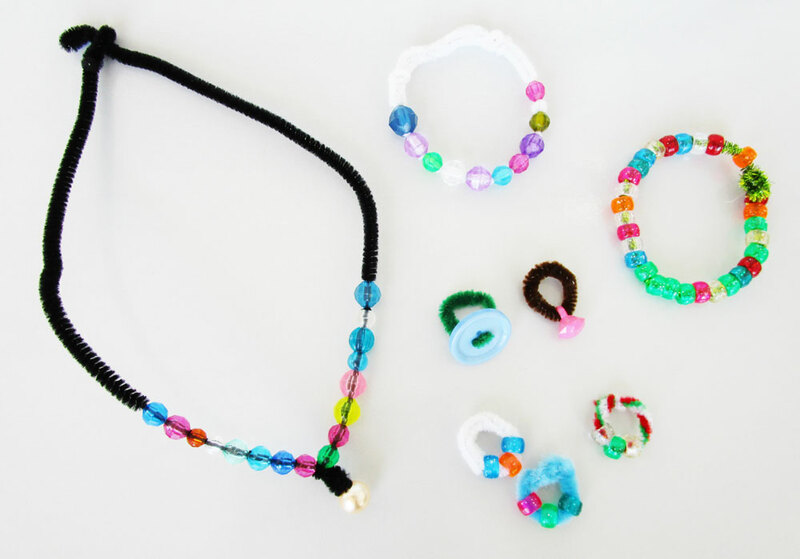 If you give a kid a container of beads and some yarn or pipe cleaners, they will automatically start stringing. It’s like magic. They key is to set out a variety of beads, rather than just one little bag. Grab a shallow plastic (lidded) container and fill it with beads you find at the craft store or dollar store. Your work is now done. 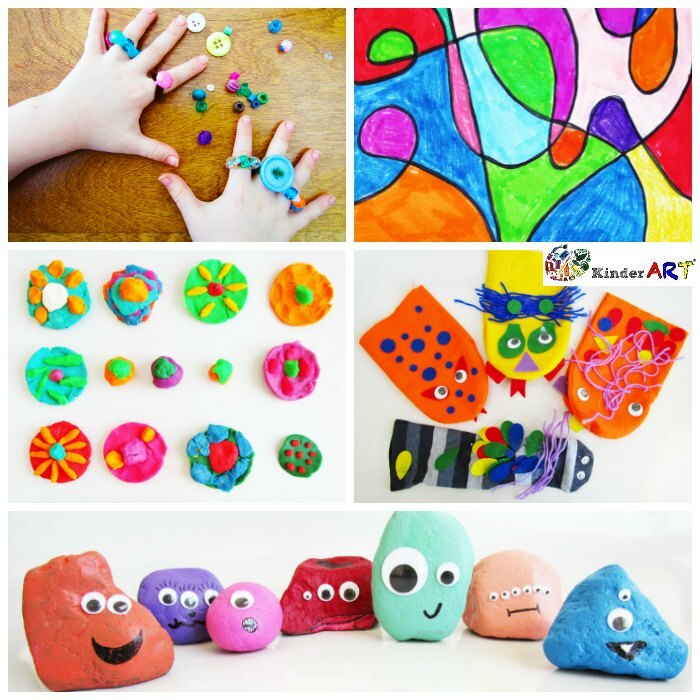 To make rock monsters you will need rocks, googly eyes, paint and glue. 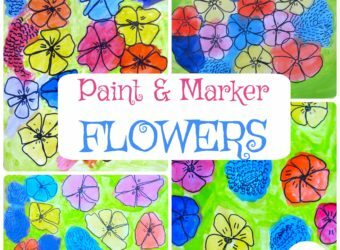 If the thought of paint makes you nervous, stick to markers instead. 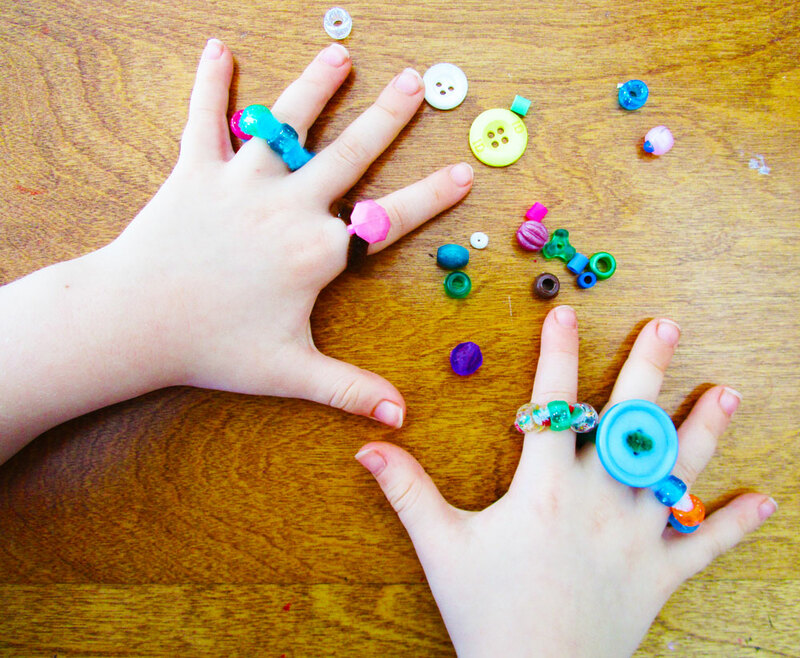 You can also provide your kids with some bits of yarn and other crafty items to glue on their rocks. 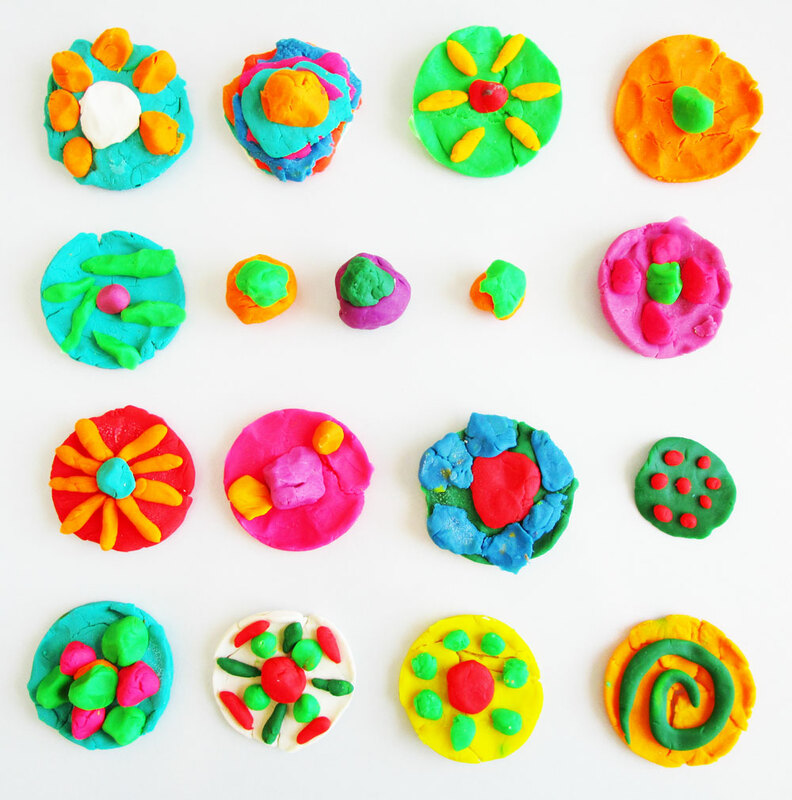 Whether you buy Play-Doh from the store or make your own play dough at home, kids will have hours of fun shaping it into blobs, flowers, fruit, pizzas, or whatever comes to mind. Now I know what you’re thinking, Play Doh is the devil’s work. And you might be right. It can be messy and is a real pain to get out of clothing (and off of bare feet!). But, I have a solution. Throw an old sheet (or tablecloth, or shower curtain) on your table before bringing out the supplies. When kids are finished creating, gather the corners of the sheet, haul it outside and shake off the tiny bits before they have a chance to infiltrate the entire house. Also, homemade dough (find recipe at the bottom of this post) is MUCH easier to clean up than the store bought stuff (and it’s biodegradable). Or, you can try Model Magic for a spongy, won’t-stick-to-anything-but-itself modeling material. Pour 1 cup of water and a few drops of food colouring into a pot on the stove. Heat to boiling and add 1/2 cup of salt. Stir until the salt has dissolved. Remove from heat and add 1 cup of flour, 1 tablespoon of vegetable oil and 1 tablespoon of cream of tartar. Mix, first with a wooden spoon and then (as the mixture cools) knead it with your hands. Repeat with different colours, or cut the recipe in half or in thirds to make smaller amounts of different coloured play dough. Note: Because you add the food colouring to the water, it should not stain your hands when you mix in the flour. For more on this recipe, visit our Full Recipe and our Tips for Working with Play Dough. 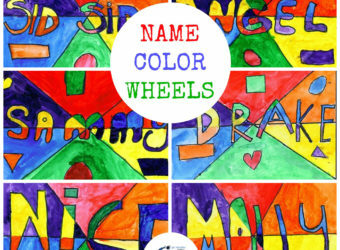 This post first appeared on YMC with the title: 5 Fun Craft Activities to Keep Your Kids Busy and Happy.